Against the odds, my lemon tree is thriving even though it is a foreigner in this part of the world. Because I know my lemon tree is not at home here, I’ve showered it with attention. I’ve pampered it, kept it warm during the winter and studied its ways. The little tree has returned my care by teaching me some important lessons about life and family. 1. Outward appearance is not a measure of worth. When my lemon tree arrived at my door I was excited to tear open the box. What was in the box and what I expected to be in the box were two different things. I expected a lush, green tree, but what I got resembled a dead stick. A better description might be a bare switch, the kind parents once cut from trees to help discipline unruly children. Upon seeing the tree for the first time, my reaction was disappointment. I removed my switch from the box and potted it in fresh soil. I watered the stick and exposed it to the sunshine. Green buds began to emerge. Those baby buds soon became branches and leaves. The unappealing little stick had been vibrant and alive on the inside all along. The way I saw it in the beginning did not prove to measure its actual worth. My perception based on first sight had been wrong. The initial judgment I made because the tree had no beauty in my eyes was not an accurate account of its potential. I thought of how often snap assumptions about others are made based on outward appearance. My experience with the tree taught me not to be misled by a person’s looks. “The Lord does not look at the things man looks at. Man looks at the outward appearance, but the Lord looks at the heart” (1 Samuel 16:7 NIV84). 2. Big is not always better. When I say my lemon tree is little, I’m giving a true description. The tree arrived tiny, and it will never grow large like other kinds of trees in my yard. Regardless of its size, the lemon tree can do something no other tree in my yard can do. It can grow lemons. The giant oak in my back yard might produce bushels of acorns, but a lemon will never be plucked from its branches. The trunk and limbs of the lemon tree are slight, but they are designed to support the weight of the lemons as they grow and ripen. We may look around us and feel inadequate because we can’t do the important work others are doing. When that happens we need to remember the lemon tree. It performs the task it was designed to do. Like the small tree, we need to do our small part. The tree taught me that large or small, we each have a special purpose to fulfill. “Each one should use whatever gift he has received to serve others, faithfully administering God’s grace in its various forms” (1 Peter 4:10). Sometimes my lemon tree starts to grow a wayward limb. This is unhealthy for the tree because too much energy is sapped by the overgrown, misshapen limb. For maximum performance, a lemon tree needs to be trimmed and shaped to keep the foliage at the top. The tree needs to be pruned back even more after harvest so it will be renewed for the next season. In the same way that a tree’s excessive limbs can deplete its strength, our obsession to acquire more and more can overtake our lives. We may become slaves to too many possessions, too many activities, too much food, too much debt; the list is unending. Life gets out of control when we lose our focus on the important things. Those errant limbs on the tree are reminders to keep life balanced and simplified. We have been warned about excess, “Be on your guard against all kinds of greed; a man’s life does not consist in the abundance of his possessions” (Luke 12:15). 4. Maturity is a process that takes time. I envisioned picking lemons as soon as my tree started to grow. A year came and went. The tree was now healthy and green, but there was no sign of fruit. I wrestled with my patience because I was in a hurry, yet the tree was too young to produce. Toward the end the second year I saw the first blossoms. The blossoms became tiny lemons. The lemons grew large and green. They were beautiful, but I knew lemons should be yellow. I wondered if the plant nursery had shipped me a lime tree by mistake. After weeks of watching and waiting, those suspected limes began to turn yellow. The fruit took its time. The ripening process did not happen overnight. My tree made me think of children being rushed to grow up too soon. We allow culture to exert control over our family, and children are thrust into situations and roles they are not ready to handle. Teenagers can’t be expected to have the judgment of an adult. All young people need guidance. Like my tree, children go through stages of development. The tree, like our children, needed time and loving patience to grow into maturity. We have been given some sound advice on guiding children through their formative years. “Train a child in the way he should go, and when he is old he will not turn from it” (Proverbs 22:6). 5. Sugar makes a difference. It was a proud day for me when those first lemons became ripe enough to pick from the tree. A beautiful and fragrant basket of lemons adorned the kitchen, yet no one was interested in eating the raw fruit. The lemons did become a palatable dessert, though, when their tartness was enhanced with something sweet. If sugar could improve the taste of the sour lemons, then maybe we should try using it in other places. A wise person once said that most relationships are ruined not by what we say to each other, but by the manner in which we say it. We may be sabotaging our own relationships by forgetting to season our words with sugar. Few actions make as much difference in our everyday encounters as the addition of sugar to our words. The lemons serve as a reminder to add sweetness to the things we say and do. “A gentle answer turns away wrath, but a harsh word stirs up anger” (Proverbs 15:1). The lemon tree did not impart its wisdom all at once. Bits and pieces unfolded over time. 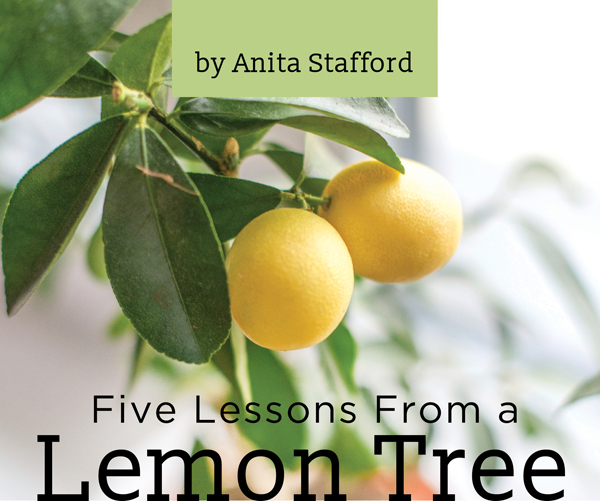 The tree had a more important purpose than surviving in a strange climate to produce lemons. The wee switch had some valuable lessons to teach with its quiet admonitions. Anita Stafford is a retired school counselor from Paragould, Ark., having received her master’s degree and certification as a Licensed Professional Counselor from Arkansas State University. She and her husband, Danny, have three adult children. Anita worships with the Commissary Church of Christ. To subscribe to Christian Woman magazine, go here, or call 1-800-251-8446.